Strolling mariachis and artwork by Hispanic artists from Arizona, New Mexico and Mexico highlight this festive, casual and friendly annual marketplace, the largest of its kind in Arizona. Chat with artists as they sell a range of distinctive and unique artwork. With art in every price range, the 15th annual Mercado de las Artes (“Market of the Artists”) offers buyers a wide selection of objects from different Hispanic traditions, including Santos, pottery, embroidery, furniture making, painting, printmaking, and silver and tin-work. Ballet Folklorico dancers will perform at 10 a.m. Saturday only. Mariachis will perform at 11 a.m., 1 p.m. and 3 p.m. on Saturday and Sunday. And at 4:30 p.m. both days, see a colorful and inspirational Dia de los Muertos-inspired procession featuring dancers and calacas. A Catholic Mass will be celebrated at 5:30 p.m. Saturday only in the Steele Auditorium. 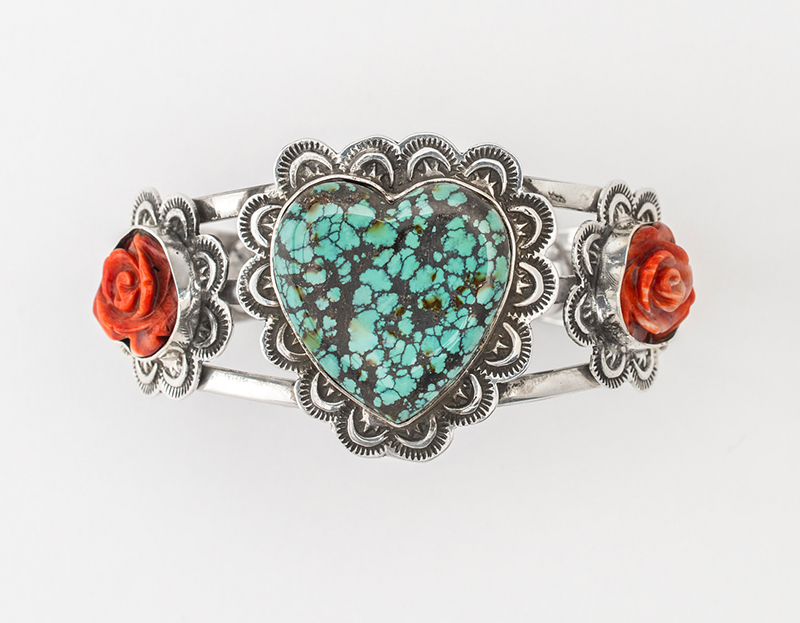 Inside the Museum Shop, Victoria Martino will be representing artist Agustin Torres Beltran (Nahuatl), who makes jewelry made from contemporary Mata Ortiz pottery shards and .950 Taxco, Mexico, silver. Each piece is one-of-a-kind, totally hand formed and comes with a story card for provenance. Also in the Shop, meet beadwork artist Bayless Alexander (Huichol), who will be offering his fine beaded jewelry, masks and animals. Meet author Albert Quihuis, who writes bilingual books for children, from 11 a.m. to 2 p.m. at the Heard’s Books & More bookstore. Also at the Mercado, the Courtyard Café will offer a menu of festive and traditional foods. Admission to the Mercado is free with a suggested donation of $10, which includes museum admission. The museum is open the same hours as the Mercado, 9:30 a.m. to 5 p.m. both days. The Mercado showcases a diversity of Hispanic and Latino/a artists from the greater Southwest as well as Mexico making high-quality, handmade, traditional and contemporary art highlighting the vibrancy of Latino/a culture. Click the link below for a complete list of participating artists and their booth locations. Application for this year’s Mercado is now closed. Please bookmark the application page for next year. Applications are usually due in August. Consult the application page for more information and to contact the Mercado organizers. 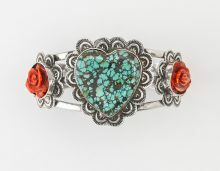 This bracelet was made by Shane Casias of Santa Fe, New Mexico, the signature artist of the 2016 Mercado de las Artes at the Heard Museum Nov. 12-13.